This is the first blog post in which we’ll be showcasing one of the new products we now carry. Blog posts such as this one will not only update you on the new products we’re carrying but will also make your summer camp shopping easier. The new product we’ll be talking about today is the NEW Hex Trunk. How do you arrive at summer camp sporting the coolest style and newest gear? Bring this trunk. 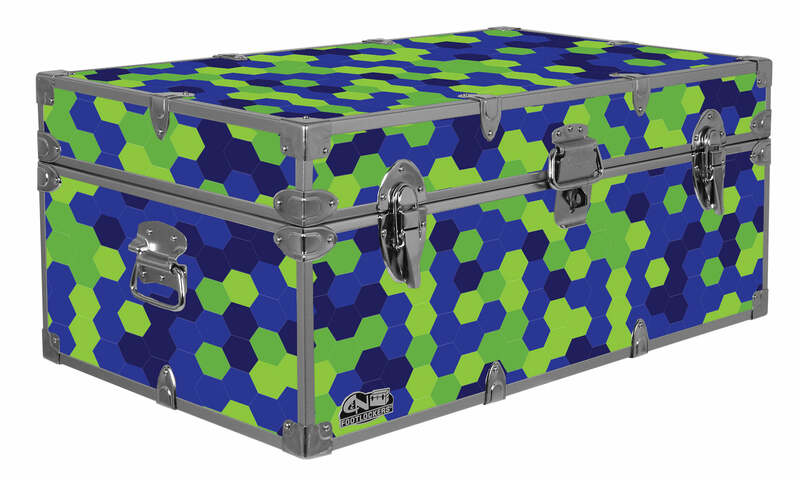 The Hex Trunk bears a brilliant motif created by our own graphic designer, Meghan. Shades of purple and green decorate this footlocker in clusters and strands of hexagons. It’s methodical, logical, yet cool. We take Meghan’s design and have it specially printed on all ten trunk panels. It’s one sharp sight to see! The same size as the popular Happy Camper, the NEW Hex Trunk is as spacious as it is solid! Built to last with C&N quality, it’s lined inside with water-resistant, odorless, and virtually tear-proof liner. The Hex Trunk is magical! We remain modest people here at Everything Summer Camp. But credit is deserved where credit is due and our camp trunks are simply the best you can find. Before Everything Summer Camp sold everything you might need at summer camp, it only sold its trademark camp trunks and the accessories directly applied to the trunks. The company wasn’t called Everything Summer Camp back then; it was called C&N Footlockers, named after the owners Craig and Nancy. Now that we’ve become so much more than just footlockers, we’ve changed our name to something that’s more inclusive and more indicative of what we sell. But since we construct every trunk that we sell right here in our own facility, we still brand each trunk with the C&N Footlockers emblem. For the last 26 years our footlocker trunks have continued to outdo the competition in terms of both quality of construction and in style. That’s what we mean when we say our footlockers are built to last with durable and dependable C&N quality. That’s why our footlockers are the best. Set the trends and go with the cool, NEW Hex Trunk for camp this summer!